ALICE IN WONDERLAND - 1951 Dir WALT DISNEY Cast: CARTOON USA - US -L. US LOBBY CARD are in excellent condition but may have normal wear such as edge wear or a slight hole. I try photograph any flaw but examining the photos closely is your best bet! Please see bigger picture for details La mayoría están en excelentes condiciones, pero puede tener desgaste del borde o algun agujero pequeño. Intento fotografiar cualquier defecto, pero el examen de las fotos de cerca es su mejor opción! 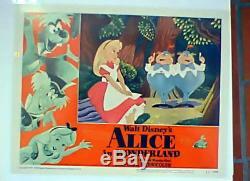 The item "ALICE IN WONDERLAND/ 23777/ CARTOON/ 1951/ WALT DISNEY/ / ORIGINAL MOVIE US" is in sale since Sunday, December 10, 2017. This item is in the category "Entertainment Memorabilia\Movie Memorabilia\Posters\Originals-United States\1950-59". The seller is "3905miguel" and is located in Sitges. This item can be shipped worldwide.